In his new book, Naked Satire, Allan aims his unique brand of political humor squarely at Benedict Donald and his White House cadre of co-conspirators, sycophants, and bootlickers. It includes more than 100 pages of satirical smackdowns that knock POTUS off his pedestal and will keep you laughing all the way to the impeachment. Allan’s daily humor post at medium.com/@allanishac has attracted nearly one million readers a month. 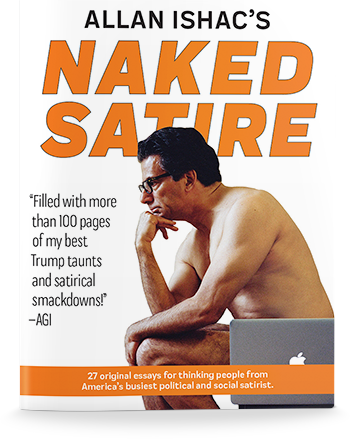 Now he’s ramping up the resistance with Naked Satire—27 original, unpublished, all-new essays designed for maximum, coffee-spewing laughs in the midst of the Trump travesty. And it’s just $3.99. Allan Ishac’s Naked Satire is consistently riotous, rude, and unapologetic—just the way his readers like it. Download it now and be part of America’s army of satire taking down Donald Chump! I’m disgusted, not defeated. And Easter Sunday is a good day to start anew.